Just when we are overloaded with cuteness here on Fox Trot Farm, I get a call from the post office bright and early this morning to tell me there is a box of peeps waiting for me to pick up! I jumped in the trusty old Subaru and hit the road. The minute I walked into the post office lobby I could hear peeping, such a joyful sound in a government building! Back at the farm, Farmer Bob helped me get the brooder box he made me in place, and I moved the adorable little (noisy) balls of fluff into their nursery. 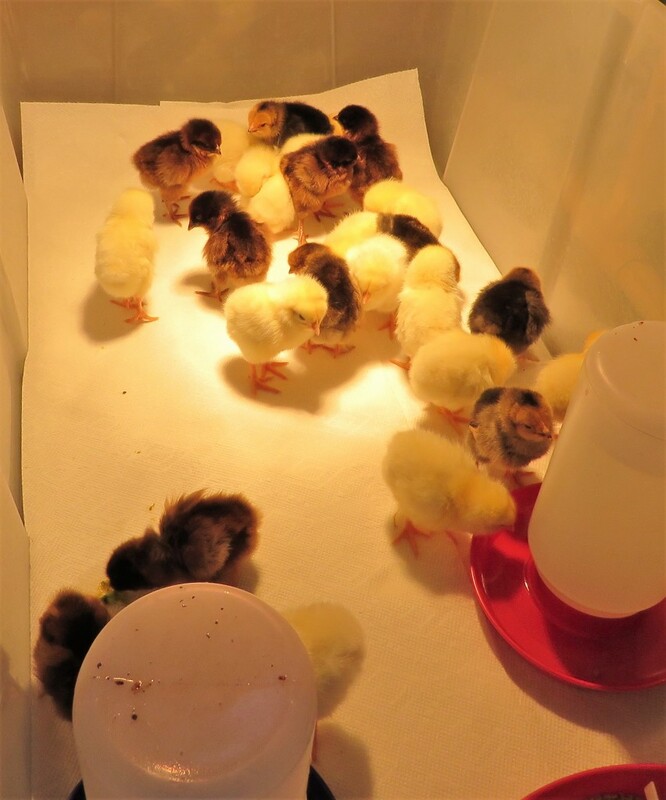 Here they are, all cozy and warm under their heat lamp, taking turns eating and drinking already. This time I just got 25 chicks, and they are all pullets (will grow into hens that lay eggs). Right now they don’t take up too much space, but they will grow quickly and soon I’ll move them into the brooder house where they’ll be able to romp and scratch in a bed of pine shavings. For now, though, I’ll enjoy their cuteness in the Peep Nursery, and you can see them there, too, when you come for a visit. 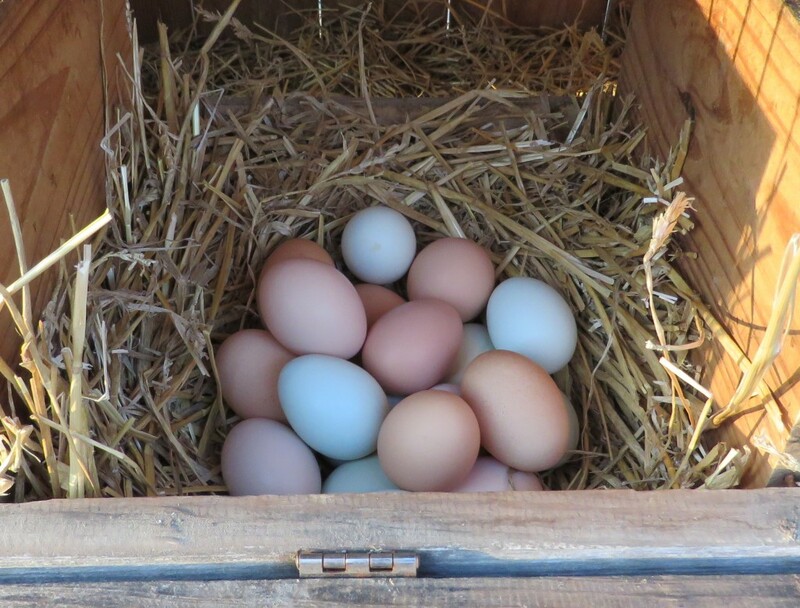 Our adult hens are working overtime and we have dozens of big, beautiful, fresh eggs in shades of blue, olive green, brown and beige. 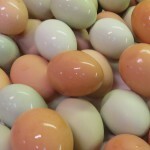 Come to the farm to get a bargain at just $3.50 a dozen for the freshest free range antibiotic free eggs from happy hens you will find anywhere and, while you’re at it, check out the new peeps! (Please call before you come so I can be sure to be at the house when you arrive.) For more info on coming to the farm, click HERE. things, but they soon grew up & produced eggs that we had to clean & box ! Enjoy them while they are peeps ! We enjoyed our farm tour with “Miss Debbie.” Alex and Anna told their parents all about the guard dogs and the sheep. We also enjoyed the fresh eggs. Anna and Alex declared them the” best ever” scrambled eggs! Thank you for being so generous with your time. Cuteness overload! Would love to live nearby so we could get fresh eggs.